Is there any Redemption for Qurrah? This book continues almost right after the third. There is more fantasy, action, and heartbreak. Overall, an intriguing read. C.J. McAllister did well with the narration. Note: "This audio book was provided by the author, narrator, or publisher at no cost in exchange for an unbiased review." I was given this free review copy audiobook at my request and have voluntarily left this review. "The Shadows of Grace" is the 4th in the five book series "The Half-Orcs" by David Dalglish. Not my favorite, but a great audiobook. When I had the opportunity to read this book, I stopped the book I was reading and started it right away. The characters and the plot are continually changing, adding to the suspense of the story. It is worth reading. This series will be added to my favourites list. Много силна! Цялата поредица е такава. Обрати, напрежение и много, много жертви (някои по два пъти). Не можеш да им хванеш бройката. Красота! Awesome book! Great and entertaining! Onto the next! Thanks to the Author for creating great characters and plot twists. I can’t stop reading! 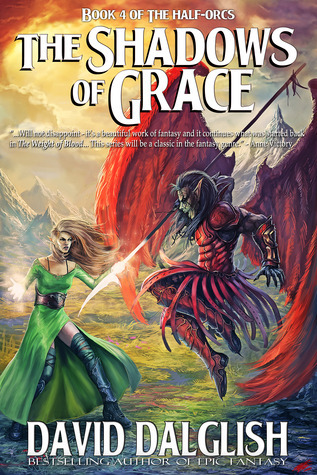 The Shadows of Grace by David Dalglish is the fourth book in the Half-Orcs series. I'm glad to see that the author got back on track with this book. With Death of Promises, the book was just way to action oriented for my liking. It was just battle after battle with fireballs and lightning strikes thrown every where. In other words, I felt the balance was a bit off. Here though, I feel that the author graciously redeems himself. Of course, I'm writing this review after the series has completed so The Shadows of Grace by David Dalglish is the fourth book in the Half-Orcs series. I'm glad to see that the author got back on track with this book. With Death of Promises, the book was just way to action oriented for my liking. It was just battle after battle with fireballs and lightning strikes thrown every where. In other words, I felt the balance was a bit off. Here though, I feel that the author graciously redeems himself. Of course, I'm writing this review after the series has completed so I doubt the author took anything I had to say under consideration but I just can't help thinking that other readers told him of the similar issues I've had. Things are much more well rounded in The Shadows of Grace and the story telling element is pushed back to the front. However, you've still got crazy battle scenes mixed in here and there as well as it should be. That's what drew me in to this series and to the author in general in the first place. Well, what can I say? If you've been with this series up to this point, then you already should know what the deal is! Picking up where the last book left off, all hell has been unleashed upon the world and demons have been coming forth from other worlds to conquer and sow chaos. As far as characters go, I'm glad to see a little more emotion out of Qurruh. You can feel his guilt and shame because you keep believing that there is a sliver of hope for redemption for the half-orc. He isn't completely turned to the dark side but his actions isn't helping him either. All he does is for love for his soon to be born child with Tessana. What I am most happy about is the author also putting more effort into Haern. In the last book, he really felt like an afterthought and was pretty much only relevant once the fighting got started. Here, we see a more emotional side of him and while he isn't the main focal point, his actions in the book still plays a factor in the overall story. Hurruq will always be Hurruq. Nothing's changed there. Where his brother is the darkness, he has seen the light and tries to find redemption although that is harder than it seems at times. What I like most about this book is the overall story. A lot of things happen yet you don't feel lost for one bit. Well okay, I lied a bit there. I did wish that the author explained a bit more in detail just why the heck the war is being fought! I get that the Gods have warred against each other and that one of them has imprisoned the other but again, it would have been great if the author spent more time going over some of these details. In fact, I really don't remember him writing anything at all about this. We have an opened portal, demons are coming through, Velixar is the bad guy but yet there seems to be other priests that challenges him and the whole nine yards and yet I didn't really remember the bigger overall picture. All I remembered was that it had something to do with Celestia and Karak. Also, the bit about the whole Melorak thing was kinda weird. We had Preston and something happened to him which turned him to Melorak and then you had the fake Melorak and then you had some other priests claiming the same thing. Anyways, it was kind of weird. Overall, events here really do set a good stage for the final book in the series and I can't wait to read it. Will the half-orc brothers find redemption? What will happen to Tessana and Qurruh? Is Velixar even the real baddie here or is someone or something more sinister at play? I'm sure all of these will be answered in A Sliver of Redemption. The title of the fifth book does kind of give things away but I'm sure the author will make it worth our time! This review has been hidden because it contains spoilers. To view it, click here. I just finished Book 4 and I'm wondering if I should wait to do this review. I'm still a little speechless :-) Let me start by saying that if you have NOT read previous books in the series you need to start with Book 1. These books are not stand-alone and you'll want to start at the beginning. That said, it's worth the journey - I can't wait for the final book - book 5. *** WARNING: Some Book 3 spoilers ahead. *** So, on to talking about The Shadows of Grace. Things looked pretty grim at the end o I just finished Book 4 and I'm wondering if I should wait to do this review. I'm still a little speechless :-) Let me start by saying that if you have NOT read previous books in the series you need to start with Book 1. These books are not stand-alone and you'll want to start at the beginning. That said, it's worth the journey - I can't wait for the final book - book 5. *** WARNING: Some Book 3 spoilers ahead. *** So, on to talking about The Shadows of Grace. Things looked pretty grim at the end of Book 3. The city had been routed, the refugees were fleeing for their lives, and, as the icing on the cake, a portal to let even MORE nasty into the world was now open. This is where Book 4 picks up. As with the previous books, the fight scenes are very well-written - some of the best I've read. At the same time, if you've followed the books from the beginning, you can see the growth of the writer - characters are more fleshed out, dialog is smoother, the work as a whole is just one step better. Perhaps that's just my perception since I've watched the characters from the beginning, so to speak, but I don't think so. Even supporting characters are vibrant. Queen Annabelle, for example, even though we don't see a lot of her, she makes a big impact and even in her limited "stage time" you get a good idea of what sort of person she is. The Shadows of Grace will not disappoint - it's a beautiful work of fantasy and it continues what was started back in The Weight of Blood. We've moved one step further along in the story but so much further, at the same time. This series will be a classic in the fantasy genre and I can't wait for the finale. I've finally figured out the timeline with these books. This series comes after all the action with master swordsman, "The Watcher" in the city of Veldaren, which has more books to yet be published. I enjoy those more than these epic battle stories between the followers of Gods. The author isn't shy about killing off major characters either. The details of the huge battles is very good and if I were playing a tabletop RPG game and had characters invested in the battle I would be very excited. How I've finally figured out the timeline with these books. This series comes after all the action with master swordsman, "The Watcher" in the city of Veldaren, which has more books to yet be published. I enjoy those more than these epic battle stories between the followers of Gods. The author isn't shy about killing off major characters either. The details of the huge battles is very good and if I were playing a tabletop RPG game and had characters invested in the battle I would be very excited. However, I just have never found READING about battles that engaging. Since you don't have any input in the outcome; like a dice role, they just get tedious. This is a dark series. That I can live with, but I did not like the way the characters behaved in this book. I suffered through it hoping that I would be glad I finished the series and not regretting it. It was better to finish the series than to stop at this book, but this book was unpleasant for me to read, since I spent a lot of time hating the characters whom I had liked previously. Good battle scenes, Harruq evolves as a character quite a bit and Jerico has an interesting issue. Read the author note at the end. It somewhat explains the growth of Qurrah. I like the play on Harruq and Qurrah and Tess and Mira. The mirror thing is very interesting. Especially after finishing this book in the series. Moving on to book 5! Things get crazy Very fun read with some great drama, sadness, joy, redemption, and horror. About as good as fiction gets if you like the human condition explored at the same time alongside a healthy dose of fun and adventure. Another enjoyable entry in the series. Shame there's only 1 more to go. They just keep getting better, even with the death of one of my all time favorite characters in all of his series. I think that it is amazing how this story is progressing. I like the religious aspects to these stories as well.